1. Boil potato until soft and put a side. 2. 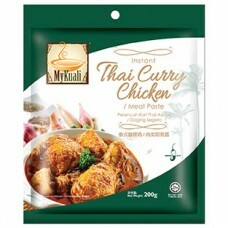 Pour in "MyKuali Instant Thai Curry Chicken Paste" and chicken pieces into wok, then stir fry with low heat. 2. Add in water and cook with medium heat, when chicken is cooked, add in potatoes. 3. Cook for another 3-5 minutes, add in coconut milk, ready to serve when boiled. to your taste preference, amount of water will directly affect the thickness of the curry. **Optional: Add in soya sauce or salt if necessary, according to your taste and preference. **Optional: You can replace chicken with other meats such as beef, duck, mutton and etc.